At the start of this year, I compiled a list of goals for 2011. I thought it would be useful to look again at the 5 general aims that I set out then, to see if there were any lessons I could learn for the year ahead. I had hoped to do this review in a single post – it turns out, I’ll need to do a series of post to cover everything. In this post, I’ll look at the first goal – getting fit. Part of the initial weight loss in the graph above was due to changes in my diet; I didn’t eat any chocolate in the first half of the year. Unfortunately, I simply displaced my chocolate craving with other sugary treats. In the second half of the year, my diet started to decline, and I started eating chocolate occasionally, which led to the weight gain. I experimented at various times with keeping a photo food diary, but found it difficult to keep this going. In the future, I’m planning on maintaining a written food diary, and looking at the use of portion control. For the goal of exercising daily, it was partial success. A quick check of my diary shows that I exercised on 312 days, or approximately 85% of the time. There were two main periods when I couldn’t exercise – two weeks in April, due to injury, and a further two weeks in November, when due to major deadline for a work project I couldn’t exercise as planned. A major improvement in my exercise plan was to start each day with some light circuit training and stretching. This only take 25-30 minutes, and is a great way to wake yourself up. It also means that if I miss a scheduled exercise session in the evening, I only need to add a brisk walk for 20-30 minutes to meet my daily exercise quota. This is something I plan on keeping on in future. I definitely didn’t get 7 hours sleep every night. I also noticed that a lack of sleep definitely hindered my diet, as I tend to binge late at night. I did start a martial art during the year. In fact, I started two, attending both Judo and kickboxing during the year. Unfortunately, in my first Judo session, I tore my pectoral muscle (an extremely painful injury – I initially thought I had cracked a rib), which led to two weeks unable to exercise completely, followed by 6 weeks of light exercise. I started kickboxing in June, and stuck at for 4 months, at which point I ditched it – I found it very boring. 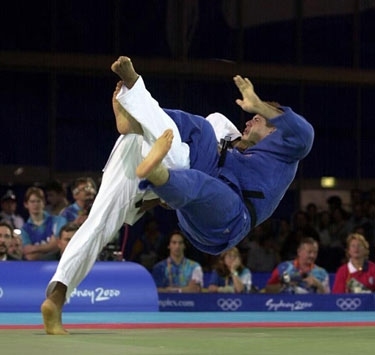 Strangely, I could see myself going back to Judo. What went wrong? The overall aim of getting fit was a worthwhile one. 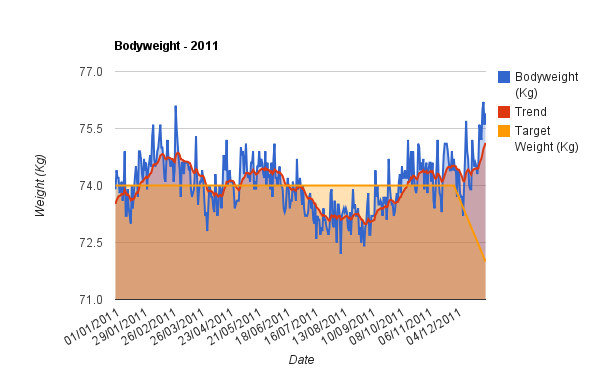 But I attempted to do too much, with too many sub-goals; I should have focused on losing weight. I was already exercising regularly, but I was still slowly gaining weight. I didn’t focus on the reasons for the weight gain – my poor diet. Until this happens, I’m not going to get fitter. I also wasn’t flexible enough in my goals – I didn’t plan on injury or work commitments stopping me training. What can I improve on? Concentrate on the core issue – my diet in this case. Everything else will fall into place when this is dealt with. Also, I need to be more flexible in planning to meet the goal. 312 days exercise out of the year isn't bad! I'd hazard a guess that it was in and around 270 more than I managed. To be honest I'm just not sure where people get the time from. By the time I get home and do what I have to the day's almost over. And first thing in the morning I'm useful to absolutely nobody. So well done you! Andi, I recommend my wee bro's blog, if you need some nutrition advice, to help match and maximise your fitness efforts: http://www.matthewarrell.co.uk/index.php/category/blog/.